Pineapple spears that get coated in a buttery brown sugar cinnamon glaze and caramelize on the grill! This will be one of the most amazing sides that you grill this summer! This Caramelized Brown Sugar Cinnamon Pineapple was the 4th recipe on the blog. As soon as I started my blog I had to put this recipe on it. 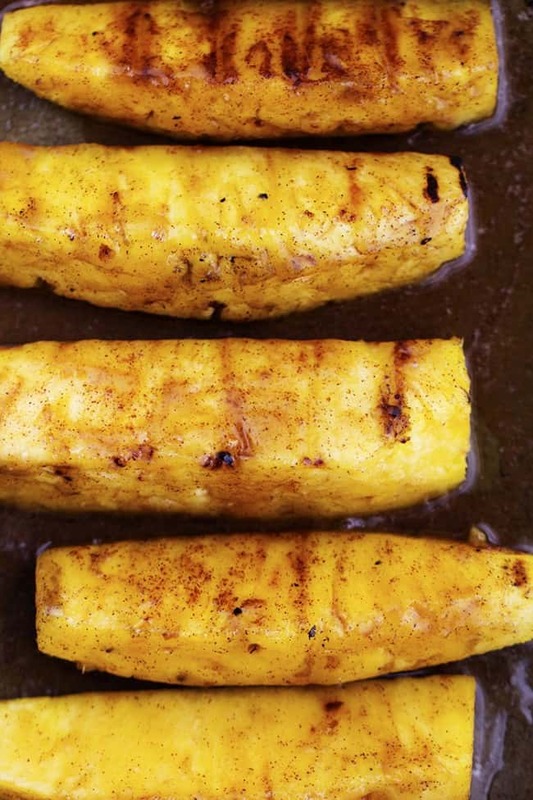 We make this pineapple every single time that we grill. It is to die for. The problem was when I started the blog, I only expected my mom to read it. Maybe some friends and neighbors. I didn’t intend for it to grow like it has. So being the very naive person that I was, I just googled an image and put it on the post. Ha! That is such a huge no no! But really. I didn’t think anyone would be reading my blog! So it was time to finally take my own pictures of the post so that I could share with you this AMAZING recipe! Have you ever been to Rodizio Grill? Then you know all about the amazing pineapple that they serve! I have been trying to make the amazing sauce that they drizzle over these, and I think I have it perfected. The sauce is incredible. It is a buttery brown sugar cinnamon glaze. 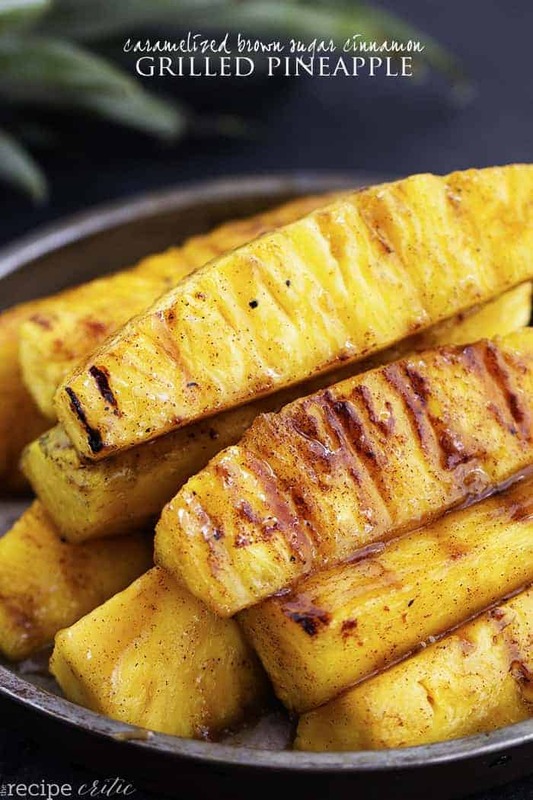 When the pineapple cooks on the grill, the sauce caramelizes and becomes absolutely incredible on top of these! The pineapple stays juicy and grills to perfection. You will be amazed with your first bite! When I tell you that this is one of the best sides that you will grill this summer, it is no joke! It goes great with anything that you will grill and it will be the talk of the barbecue. I know that you will love this just as much as we did. It is truly a five star recipe! Lay the pineapple spears on a pan. Sprinkle lightly with cinnamon. Whisk together the butter, brown sugar and cinnamon. (If it seems thick, I always put it in the microwave for a few seconds so that it can easily pour on top of the pineapple.) Spread on top of the pineapple. Grill for about 7-10 minutes or until it is starting to turn golden brown. I always like to brush the excess sauce from the pan back on top of the pineapple before serving. Yummy! Do I have to share? Just what I needed for Father’s Day! This makes it sounds like you have to cook this in a pan on the grill? I’ve never cooked in a pan on the grill … though I have used foil. THANK YOU FOR ASKING THAT. I THOUGHT THE SAME THING. Made last weekend! The cinnamon smelled wonderful while grilling! Smell brought neighbors out to find out what smelled so good! Shared all around! Neighbors and family agreed “Best pineapple they ever ate!” Big hit! Note: I cut the pineapple into 1/2 thick rings and marinated them in the sugar/cinnamon for about an hour before grilling. Pics on my FB page! Do you turn the spears or just grill one side? What do you mean for 1 t cinnamon, is that tsp or tbsp? Whooohoo! You wrote down so many exclamation marks that I just HAVE to make this come camping week (oh, in southern France. But they’ll eat it as a side to their grilled snails.)! I’m going to try this for new year’s eve grill all the way in Cairo! thanks for sharing and wish me luck! I don’t have a grill. I’d really like to make these pineapple spears. Could I use a pan on my stove? I think certainly this could be done. In fact, I use the side burner on my grill to get them started. Melt the butter, cinnamon, and brown sugar together in a large frying pan, then add the spears and get them cooking. I finish them on the grill to get the char marks, but you certainly wouldn’t have to. Just cook till glazed and tender. Another thing I’ve done is use the leftover liquid to mix with rice. Delicious! Nothing can compare to grilling but broiling is a close second. Do you have a good recipe for Honey Walnut Shrimp? The version from Panda Express is a little bland for my tastes. Have you ever tried coconut oil instead of the butter? Question: Has anyone ever tried this recipe over a campfire? I am supposed to take an appetizer for our camping trip this weekend, and this looked fun! Trying to decide whether the campfire flavor would go with the pineapple or not.. ? Hi Alyssa, This looks so interesting & tempting… Would like to know if you use salted or unsalted butter. Planning to cook these on my daughter’s bday. Book club loved this. I added a coconut rum sauce to dip in or drizzle, but it really didn’t need it. By the wsy, made it in an iron grill pan, but would be easier on a real grill as sugar tends to burn. I made it just before it started to burn in the slats, but still had the marks. It had started to rain, and I was all resdy to go to book club and hubs was not home yet to ho out and get messed up in the weather for me! Still tasted great, just be very csreful. You could try broiling, just no marks. Can you bake or broil the pineapple?? I don’t have a grill and would love to try this. how about using a grill pan? then you’d get the grill marks and can cook them inside. I wish I had seen this recipe sooner because these would be a great accompaniment to my Easter ham dinner! Does this have to be served right off the grill? Having a graduation party and will need a couple batches. Oh no, not at all. Wrap it in some tinfoil or keep it in the oven on low to keep warm and it will be great! Happy Graduation Day!! What about using pineapple juice instead of butter? Can this be made in the oven? At what temp and for how long? Yuppers I am DOWN with this. Gonna give it a try. Looks awesome! Thanks. Looks great! What is the nutritional info? 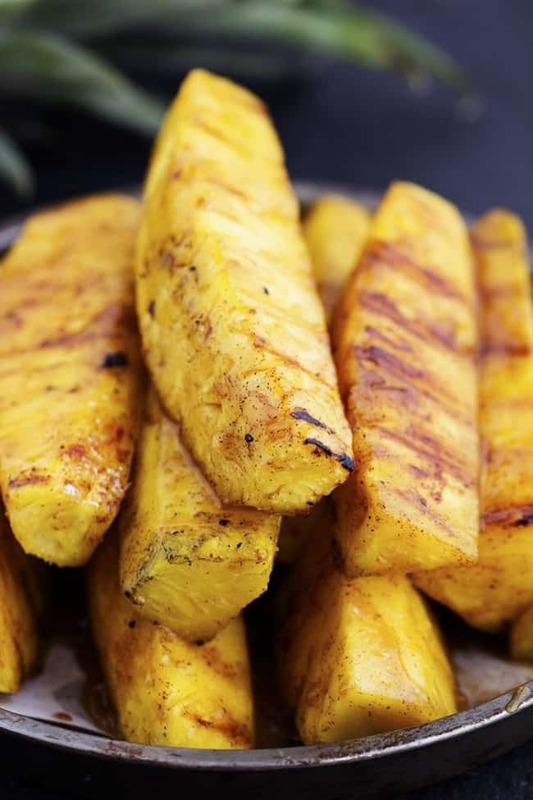 What is the nutritional info on the grilled pineapple? Is “T” a tablespoon or Teaspoon??? Hi. Have you ever made ahead for a party? Can you store in fridge and eat cold or at room temp? I’m asking about the grilled pineapple. I have never made it ahead but I would recommend making it the same day. You are able to make quite a lot at one time if needed. It is best fresh off the grill. Can this be prepared the night before. Do yo cook the pineapple Spears directly on the grill or do you but the pan on the grill and cook it in the pan?